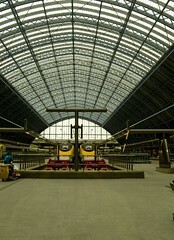 managed to get to see the newly restored St.Pancras train station the other week and it is most impressive. It is a huge structure that has been brought back into circulation after a number of years of neglect. It made me appreciate that sometimes the old structures are worth preserving and restoring whilst they still bring value and use. The ones to tear down are usually the ones that cease to offer any purpose. Sometimes it is easier for people to tear down and rebuild the old when actually the greater benefit would be restoration. When should we rebuild and when should we restore? A question that I need to ask myself more often.